Aside from my own, I did get to do one other winter card this year as a commission. Gretchen (proud owner of Nugget) saw my Squittens card design and asked me to draw her up a cheerful cephalopod all her own. We decided on cool wintry colors, and having him making snowflakes as a proper activity for a cute little octopus celebrating the season. The hat was a last-minute addition that gave him a bit of extra interest, and really pulled together the whole theme of the piece. 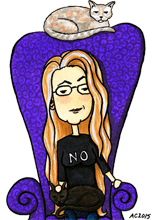 She’s gotten her cards sent and received by now, so I thought I’d give a last bit of holiday cheer by sharing the art with you. 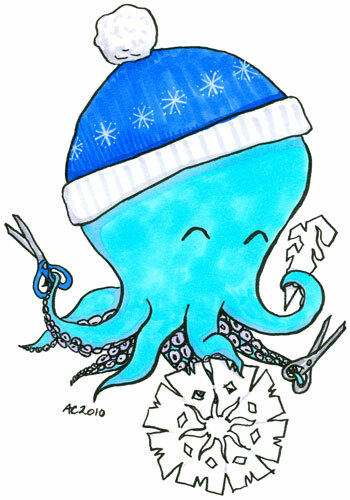 Winter Octopus, 5″x7″ pen and ink and copic markers on watercolor paper, nfs.